We reserved a rental car from Enterprise and they picked us up around 8:30 a.m. and took us to the Enterprise office to fill out paperwork. We enjoyed our drive out of the city toward Taos. The “high road” is the name used for the mountainous trip from Santa Fe to Taos. The “low road”, which we drove back to Santa Fe, is through the valley. The drive to Taos was slow due to the terrain. We passed through many small villages where artists have their studios. We stopped at a pottery studio in Ojo Sarco which looked interesting. When I say this was in the middle of nowhere, I mean it. We drove down a desolate little road off the main highway and came upon the little studio. Inside was the nicest couple who were the potters. 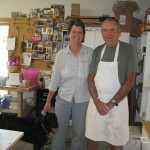 They have lived here for 30 years and mostly show their pottery at galleries around the area. I picked out a beautiful serving platter. We enjoyed talking with this couple so much we asked if we could take their photo, and they were glad to do it. They both work and live on this property. They had a little garden outside the studio. I can’t imagine a more peaceful place to work. 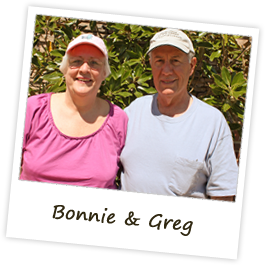 It’s very isolated, but they evidently enjoy it and we enjoyed meeting them. We stopped at the Sanctuary of Chimayo, in the little village of Chimayo. 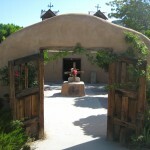 The shrine was built in 1810 when a Chimayo friar found a crucifix in the dirt. He took it away and 3 times the crucifix appeared back in the original location. So a church was built on the spot. The chapel was original and it was very interesting. A room next to the chapel was built around the dirt where the crucifix was found. The original crucifix is at the alter in the chapel. A nice priest was talking to the tourists. He said today was his 91st birthday and he would be saying mass today. He came over here from Barcelona Spain as a young man and had been here ever since. Many religious people come to this chapel to pray and be healed by rubbing the dirt on their bodies. Greg and I both took a small amount of the dirt from the ground and rubbed it between our fingers. Our prayer is that we continue to have good health as we enjoy our retirement in the years to come. 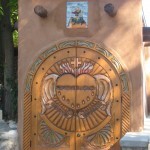 Taos is a small little town with many art galleries and studios around the square. Today was my day for shopping for myself. We found a nice little jewelry store which showcased local artists making turquoise jewelry. I found a beautiful pair of earrings made of turquoise and sterling silver. I forget the artist’s name but it is engraved on the back of the earrings. The name of her gallery was Mesa’s Edge. 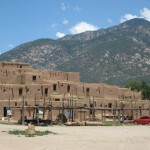 We drove out to the Taos Pueblo. This is considered to be the oldest continuously inhabited community in the USA. The native legends and detailed oral history trace their existence back to the beginning of the evolution of man. The native language, Tiwa, is unwritten, unrecorded, and not divulged. You can walk around these original dwellings. Many natives are selling goods, food, etc. We bought some bread from a little old lady who baked it this morning in her outdoor adobe oven. There is no electricity and no running water. 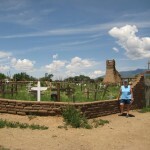 In the photo of the church cemetary, the ruins at the back of the cemetary are of the San Geronimo Church which was built in 1619. 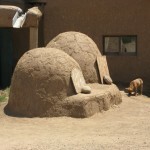 The history of this place was incredible and I’m sure there is much more on the internet about the Taos Pueblo. 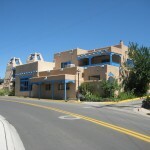 Tomorrow we will go into “Old Santa Fe” for more local art galleries. The weather has been wonderful. It’s warm with low humidity.